August weather has been a little more familiar than the heatwave we’ve experienced over the last couple of months but as always, nature adapts and familiar sights are in the wood even if they are a little earlier in the season than we would expect. 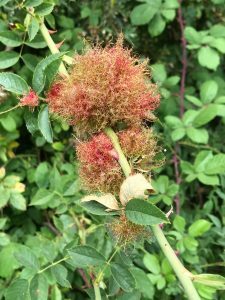 Look out for the Robin’s Pincushion (see photo) which is a gall caused by the larvae of a tiny gall wasp, Dipoloepis rosae and is very common in hedgerows and woods. It is usually found on Dog roses (Rosa canina) and gets redder in the autumn, but this year it seems to be maturing early and can be easily recognised. Each gall has many grubs inside it which feed on the gall tissues throughout the winter and emerge during the spring as adults. Look around and you’ll see that the wood is full of other interesting things at this time of year too. Fruits and nuts, fascinating seed heads and of course, the ever present wildlife which really appreciates the cover provided for them are just a few things to watch out for. Why not have a wander around and see how the wood is changing with the progress of the season, you won’t be disappointed!